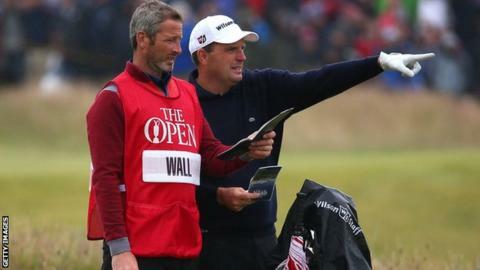 England's Anthony Wall finished the 144th Open Championship with a share of 12th place on an impressive nine-under-par after a string of early birdies. Having begun on seven-under, Surrey-based Wall picked up four shots on the front nine to go to the turn in 32. "I felt like I was birdieing everything," he told BBC Sport. "I felt I had a chance. "But you know what the back nine is like at any tournament. You've got to hole your putts." Wall has only missed the cut once in six Opens. His best finish came in 2006 at Hoylake when he was the leading British player, tieing for 11th, 10 shots behind the winner Tiger Woods. He booked his place for the 144th Championship in the Open Qualifying Series, in March when he came second at the Joburg Open. Since winning the Alfred Dunhill Championship in South Africa in 2000, the lifelong QPR fan has been runner-up seven times on tour, including once at St Andrews in the Dunhill Links Championship. Playing with 2009 Open champion Stewart Cink, Wall was in dreamland when he picked up his fifth birdie of the round to go to 12 under at the 11th, just one off the lead. But the dream soon died when he ran up successive bogeys at 13 and 14. "I finished up as the top British player at Hoylake in 2006 and that was fantastic. I loved every minute of it," he said. "But this means so much to me as I had my beautiful wife and kids up here with me. It doesn't get it better - and on the best course to play too, at the home of golf. "When I was in my 20s, I used to take things like this for granted, but, now I'm 40 I'm happy to be doing it."